Clint Eastwood’s latest film, “Sully,” outlines the drama surrounding the sudden crash landing of US Airways Flight 1549 into the Hudson River, focusing specifically on the heroic pilot behind the miracle, Chesley “Sully” Sullenburger. While its plot is too paper-thin to truly succeed, Eastwood and his fantastic cast bring a sense of humanity and tension to the proceedings, making “Sully” worth the watch. The plot is simple and straightforward. Chesley ‘Sully’ Sullenburger (Tom Hanks) and his co-pilot Jeff Skiles (Aaron Eckhart) expect a normal flight out of LaGuardia Airport. Within minutes of taking off, their engines are hit by a flock of birds, causing both his engines to break in the air. An air traffic controller tells Sully, via radio communication, to land his plane at a local New Jersey airport. But sensing he can’t make it there, Sully takes an enormous risk and lands his plane on the Hudson River. Miraculously, he lands the plane, saving all 155 passengers aboard. But this is the widely known “Miracle on the Hudson” story; the main purpose of the movie is to explore what happened immediately after the crash. Sully is confronted by the National Transportation Safety Board with possible evidence that his left engine may have still been working after all, meaning he could have actually landed the plane at an airport and avoided endangering the lives of the passengers. If Sully did take an unnecessary risk, he’ll likely lose his job and never get to be a pilot again. While the plot is certainly paper-thin, screenwriter Todd Komarnicki wisely focuses on themes and character over plot complexity. Sully, and the movie as a whole, is haunted by a serious question: Did he make the right decision, or did he take a dangerously serious risk? 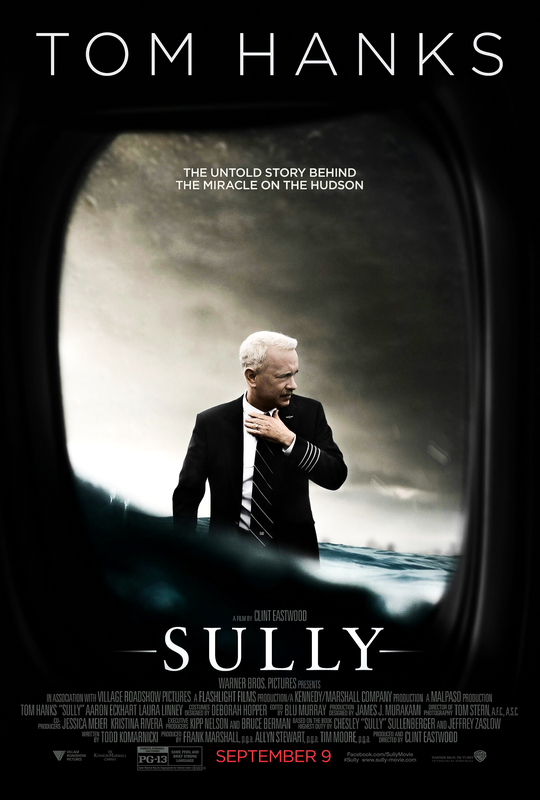 Throughout the film, Sully is haunted by both flashbacks to the actual crash, but also nightmares of him instead crashing the plane into a building (9/11, and its chilling aftermath, is a minor motif in the film). The National Transportation Safety Board repeatedly grills him over his decision. All the while, Sully is constantly praised by the media, appears on Dave Letterman, and is congratulated by New York Mayor Michael Bloomberg. The tension between Sully’s uncertainty and the rest of the world’s excitement helps the film succeed in spite of simplistic plot. I cannot say enough, however, about Eastwood’s brilliant direction. Every scene is shot deliberately to maximize tension, while also giving his actors room to breathe. The actual “Miracle on the Hudson” scene is spectacular, excellently recreating the feel of traumatic events. Everything is a fast-moving mess, but both the characters and camera work are sharp and focused. Eastwood’s focus on simple moments of humanity is what really sells his direction; the pilots’ typical pre-flight routine, banter between passengers, touristy obsessions with cheap snowglobes, and other fine details make the passengers of Sully’s fateful plane ride seem like humans, not extras, turning what would have been a predictable scene (the actual crash) into a tense thrill ride. The film ultimately shines because of its smart focus on the simple humanity of these characters. Sully isn’t heroic; he’s nervous and fragile, overwhelmed by everything that’s happened to him. The fact that Sully and the passengers very easily could have not survived the crash is constantly felt by each of the characters. Sully and his co-pilot Skiles spend each night sleepless and jogging through the city. The number of passengers on board the plane, 155, is repeated throughout the film, both during the actual “Miracle on the Hudson,” and after it, as a haunting reminder of how easily everyone could have died in tragedy, and how miraculous it was that everyone survived. “Sully” admittedly falls flat on several counts. Its plot is incredibly simple and straightforward, with a rushed and unsatisfying ending, and a few plot threads that are briefly established but never actually built upon. But the combination of a fantastic cast, thrilling direction, and a deep sense of humanity make “Sully” worth the ride.